One of the best parts of the holiday season is the food, but trying a new recipe can be stressful. 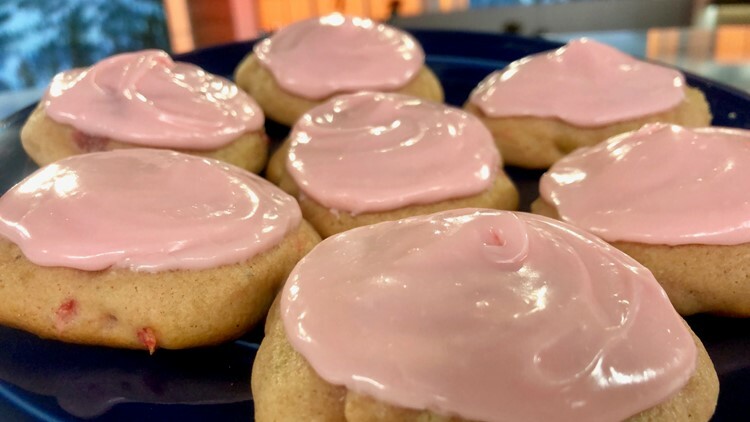 So the KREM 2 Morning News crew is sharing their go-to recipes. 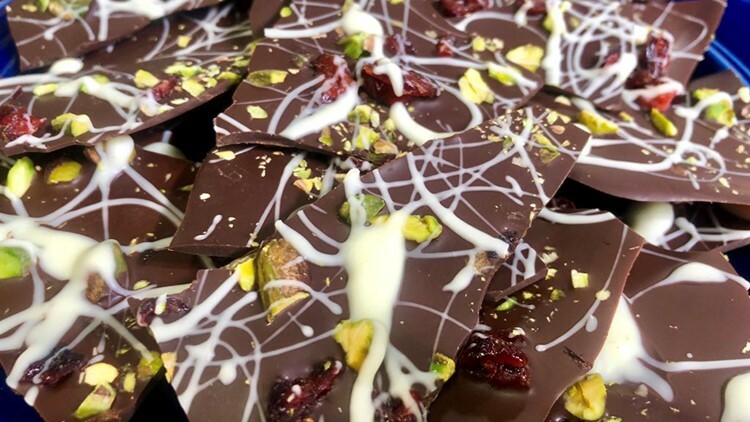 The holiday season is a time for family, giving and plenty of treats. And the KREM 2 crew is great at enjoying that last one. So we are celebrating the 12 Days of KREM Christmas. 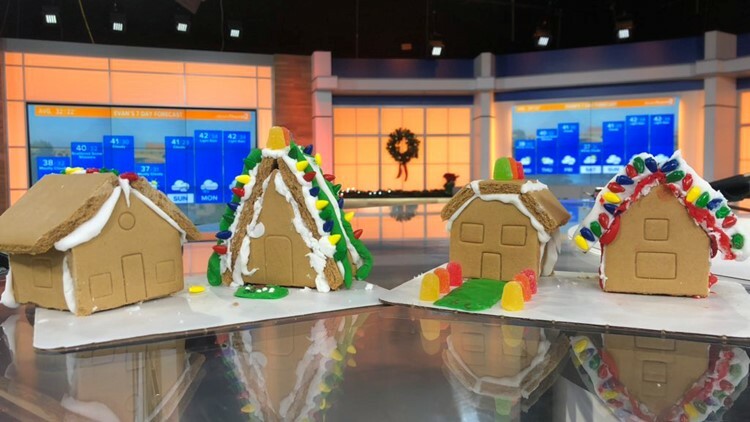 Tune in each morning to watch KREM 2 News as Brittany Bailey whips up another holiday treat. She's walking us through everything to help avoid baking fiascos. Recipes will be listed at least one day in advance so you can create Christmas goodies along with Brittany. 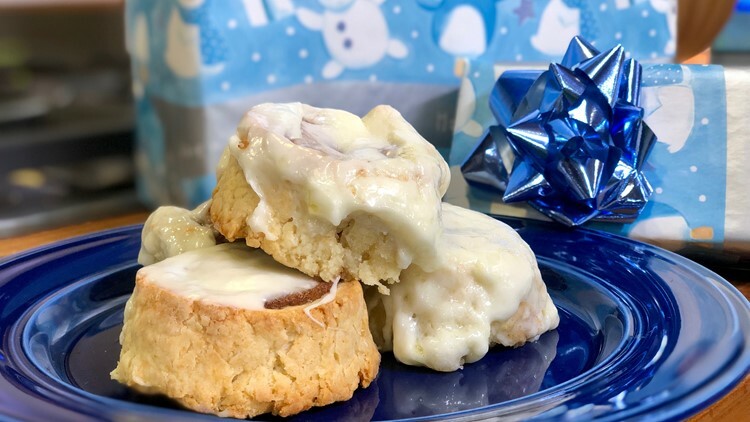 For the final 12 Days of Christmas recipe, Brittany Bailey is sharing her family favorite. She grew up making this dessert with her mom and sister. Now she's honored to share with all of you. Mix softened butter, flour and cream to form dough. Chill for at least one hour. Roll out dough 1/8-inch thick. Cut into 1-inch rounds (or use your favorite small cookie cutter). Coat both sides with sugar. Place on ungreased cookie sheet. Prick with a fork 3-4 times. Bake for 7 to 9 minutes. 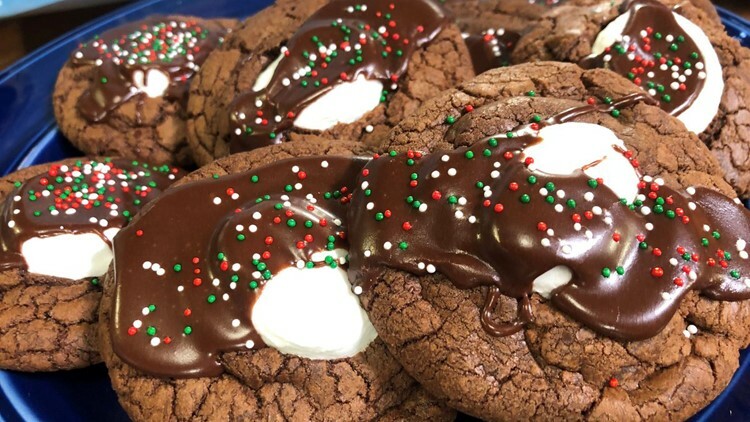 The cookies should be puffy but not brown. Let cool. Mix butter, powdered sugar and vanilla. Add cream as needed until proper consistency. Separate into batches and add food coloring, if desired. 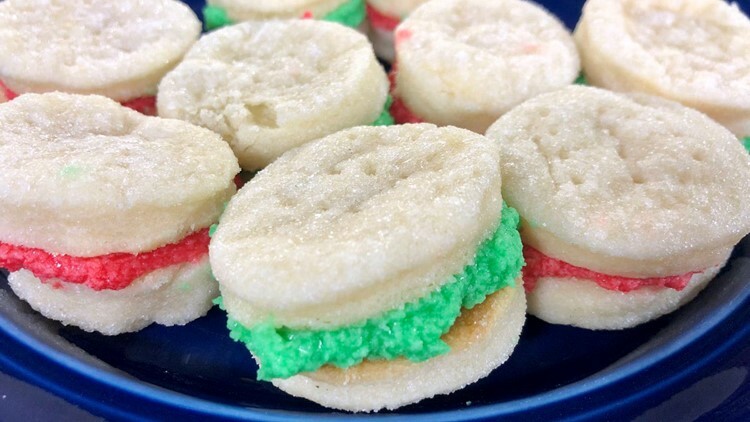 Frost one cookie, add another on top to make a sandwich. 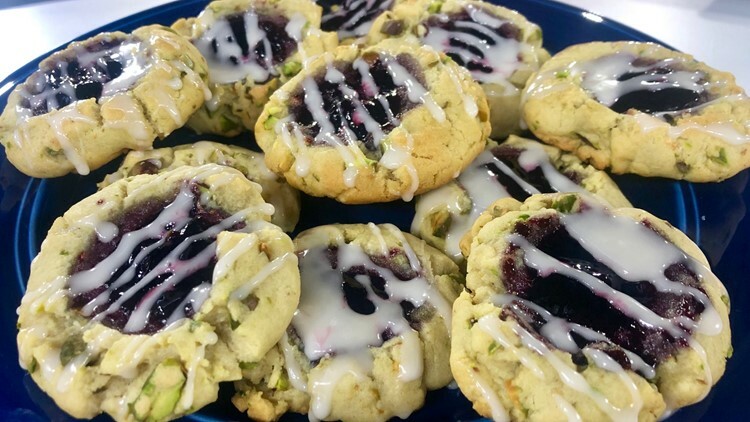 We borrowed this recipe from Pillsbury. Mix together shortening, sugar, eggs, sour cream and vanilla. Sift together remaining dry ingredients and spices. Add to wet mix. Fold in walnuts and chopped cherries. Chill dough for two hours. 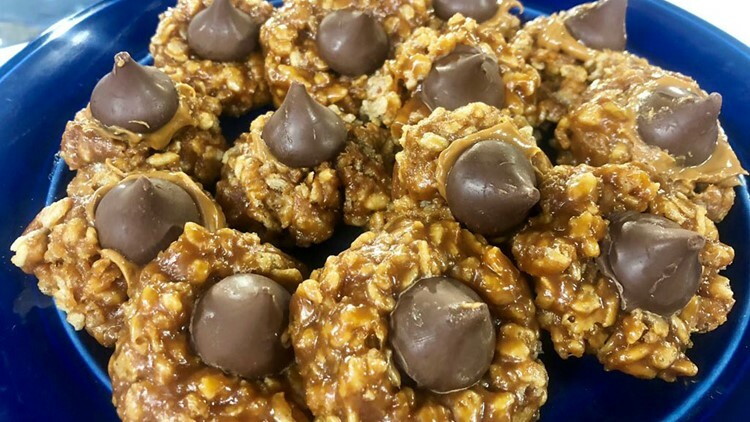 Form cookies into balls and place on greased baking sheet. Bake for 9 to 11 minutes. For frosting, mix together ingredients. We borrowed this recipe from Taste of Home. In honor of Gluten-Free Baking Week, we're trying something new thanks to Cooking Light. It is a great recipe for anyone in a hurry and it only includes three ingredients! We borrowed this recipe from Cooking Light. We borrowed this recipe from Mom On Timeout. We borrowed his recipe from Glorious Treats. Stir together cream cheese and cheddar cheese. Divide in half. Mix in pesto to one half. Mix in onion, mustard and red pepper sauce to other half. On a serving platter, form each mixture into two tapered oval shapes to resemble pine cones. 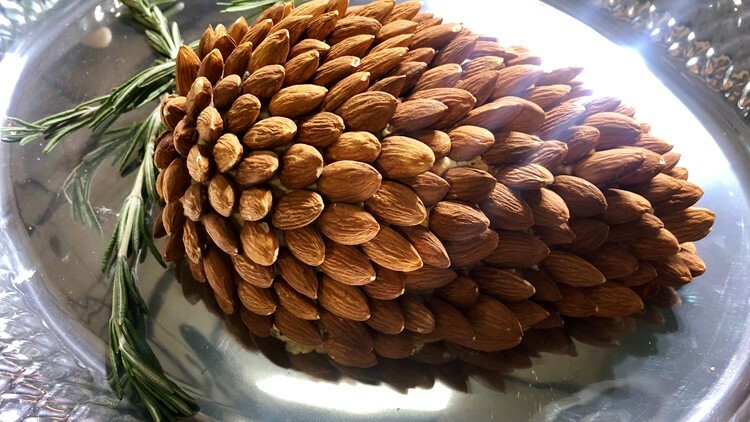 Starting at the taper ends, press tips of the almonds into the cheese balls, overlapping as you go to resemble a pine cone. Place rosemary sprigs at the tops to resemble pine needles. In a large bowl add the melted butter, brown sugar and vanilla. Whisk to combine, then add in the egg, 1/2 cup of cranberries, 3/4 cup white chocolate chips and the orange zest. Whisk together. Bake for 18-20 minutes in a 13 x 9 pan. For the frosting, melt the white chocolate in a microwave safe bowl for 1 minute in 30 second increments. Add the cream cheese, 3/4 of the white chocolate you just melted, 3 cups of powdered sugar, orange juice. 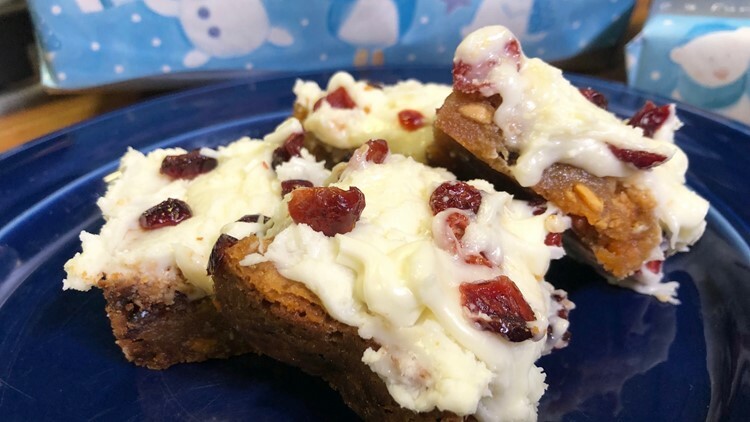 Spread the frosting on the bars, sprinkle on the remaining 1/4 cup of cranberries and drizzle on the remaining white chocolate. Store in and serve from the refrigerator. 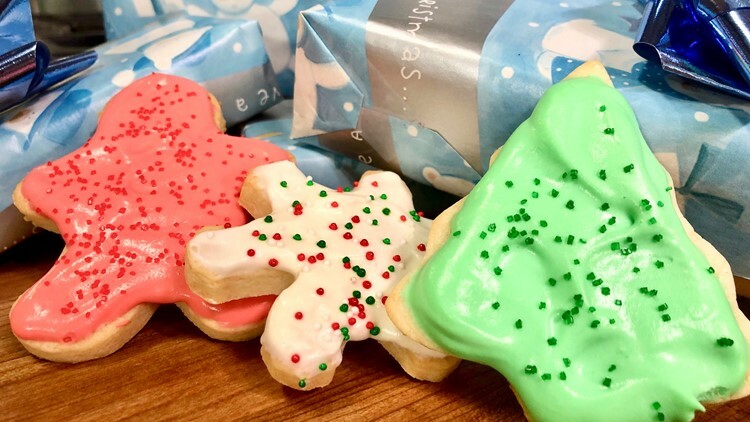 In honor of National Cookie Cutter Week, we’re creating festive Christmas cookies. The recipe below has two parts, the actual cookie and the frosting. Don’t try this recipe if you are in a hurry. It takes nearly three hours when you include chilling time. In a large mixing bowl with a handheld electric mixer or in the bowl of a stand mixer fitted with the paddle attachment, cream together the butter and cream cheese until light and fluffy, 2-3 minutes, scraping down the sides of the bowl as needed. Add the sugar, egg yolks and vanilla. Mix well, another 1-2 minutes. Add the flour and salt. Mix until combined. Don't overmix. Spread the dough into a thick rectangle on a sheet of plastic wrap; cover. Refrigerate and chill the dough for two hours (or up to 12 hours). Roll the dough out on a lightly floured counter (or dough rolling mat) to about 1/4-inch thick. If the dough is too firm straight out of the refrigerator, let it rest at room temperature for 10-15 minutes before rolling. Use cookie cutters to cut into shapes and place 2-inches apart on the prepared baking sheets. Bake for 10-12 minutes until set but not browned on the edges or bottom (otherwise they won’t be soft and tender when they cool). Remove the cookies to a cooling rack to cool completely. Frost as desired. In a large bowl, combine the softened cream cheese, powdered sugar, salt and vanilla. Mix until very smooth and light and no lumps remain. In a separate bowl, beat the cream to stiff peaks. Add the whipped cream to the cream cheese mixture. Mix until well combined and smooth. 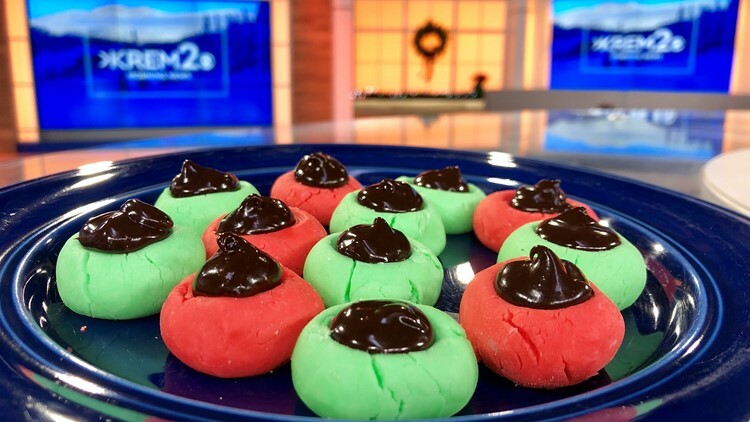 KREM 2’s Jen York says this is her favorite family holiday treat. And there is nothing out of a can here. As she says, it’s all the “good stuff”. Bonus-- there is no yeast required. We are borrowing this recipe from Sugar Spun Run. We know not all holiday baking turns out as expected. So share your best recipes, Pinterest fails and before and after photos on the Facebook post below.